A court in Abuja has ordered that a brother to Senator Dino Melaye, Samuel Melaye and three others be remanded in Kuje prison, Abuja for allegedly aiding the Senator to jump off a moving police van. The others are Amaefula David, Pius Inyang and Mohammed Wazari. The order for their remand in prison was made after their arraignment before the Chief Magistrate’s Court, Mpape, Abuja on a First Information Report (FIR) filed by the police. The FIR linked them to the Tuesday’s incident at Area One, Roundabout, Abuja, where Melaye reportedly jumped off a police vehicle that was said to be conveying him to Lokoja (Kogi State) where he was to be arraigned before a court on a pending charge. In the FIR, the defendants were charged with criminal conspiracy, obstruction of public servant from performing his lawful duties, abatement and assault on police officers, offences said to be contrary to sections 97, 85, 267 and 173 of the Penal Code Law. They pleaded not guilty to the charges when the FIR was read to them on Wedensday. Their lawyer Nkem Okoro, from the law firm of Mike Ozekhome (SAN), applied orally for bail for the defendants. The Nation reports that the police objected to the bail application, following which the presiding magistrate adjourned to April 30 for ruling. 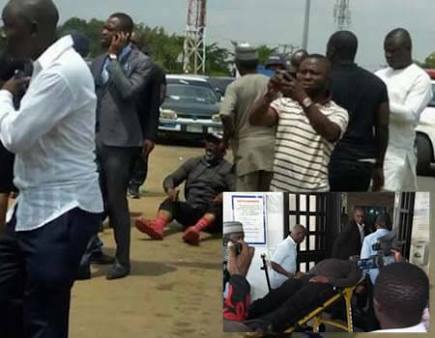 Melaye’s brother and others are said to have been arrested by the police at the hospital where Melaye was admitted after the incident. They were also alleged to have “jointly conspired and attacked a team of police officers from the office of the Inspector-General of Police S.T.S FHQ, Abuja while conveying Senator Dino Melaye to the court in Lokoja, Kogi Statein Area One Roundabout, Abuja”.